The sixth in a series where we unearth the story and style behind iconic photos. Björn Borg, the cool Swede—nicknamed “Ice”— and John McEnroe, the surly kid from Queens—“Fire”—brought the game of tennis into the modern era. Today, their record stands at 7-7, forever locked in a joust. But the rivalry’s defining moment was the 1980 Wimbledon Championship. In honor of the ongoing 2013 Wimbledon, we look back to the most epic tennis match in history, and the men who defined it. The four-time defending champion, Borg (wearing Tretorn sneakers), faced southpaw and first timer McEnroe on the grasses of Centre Court. Borg aimed to set the Open Era record with a fifth consecutive Wimbledon title. McEnroe looked to usurp his childhood hero. 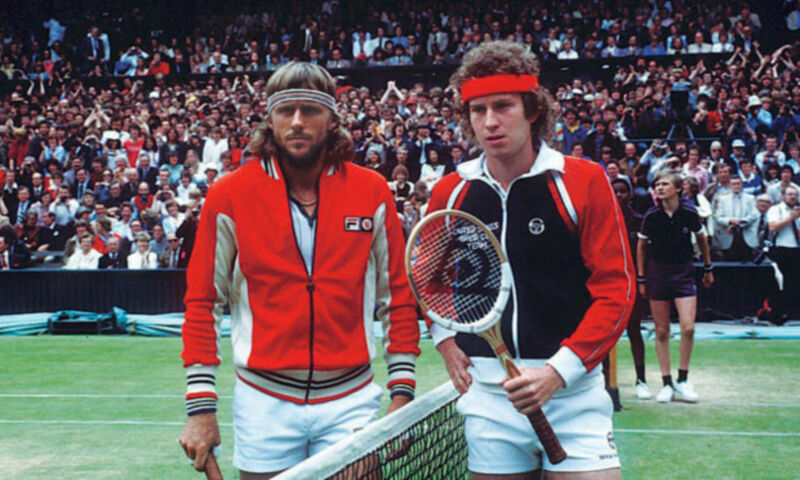 The two men, opposites in personality and style, battled through four sets, until Borg defeated McEnroe. But, it’d be Borg’s final moment at the top. Although McEnroe lost the match, he exacted revenge over Borg in the U.S. Open later that year. The victory sealed him forever as an American tennis icon, and it ushered in Borg’s quick decline and retirement. In the following Wimbledon Final (1981), McEnroe defeated Borg and ended the Swede’s run of 41 consecutive wins at the All England Club. Two years later, Borg retired. With his success, McEnroe popularized tennis nationwide, and he was one of the first players to sign a professional endorsement (an 8-year contract with Sergio Tacchini). Although temperamental and confrontational, McEnroe played the game with a passion and grace few men have emulated (his game at the net is unparalleled). He also brought the iconic 1980s style of sweatsuits and tennis shirts to the mainstream American public. The “Fire” initiated modern tennis, and he will forever be a court—and style—icon. Björn Borg (left). Jacket: Fila Vintage Wool Jacket ($120); Shirt: Fila Vintage Polo ($50); Shorts: Fila Heritage Short ($22.50); Headband: (see below). John McEnroe (right). Jacket: Sergio Tacchini Bianco Sweater (70€); Shirt: Sergio Tacchini Fenwick Man Polo (55€); Shorts: Sergio Tacchini Black Short (in white; 40€); Headband: (see below). Extras: For true vintage, you can outfit yourself with these era-authentic products: Headbands: Borg (£20); McEnroe (£6). Shirts: Borg (£50); McEnroe (£42). For further reading, check out these two books on the tennis stars' rivalry: Epic and High Strung. Or, to watch the 1980 Wimbledon Final, Fourth Set, see the following series: Part 1, 2, 3. Image via Tennis World USA.